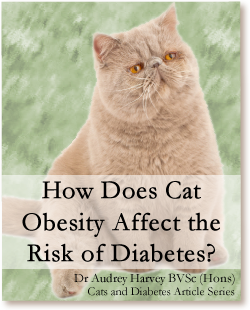 How Does Cat Obesity Affect the Risk of Diabetes? Feline diabetes is similar in nature to Type 2 Diabetes Mellitus in people. This condition is characterized by a decreased production of insulin, as well as a poor response to insulin by the body. Feline diabetes symptoms include increased thirst, increased urination and increased risk of urinary tract infection. It’s possible for untreated diabetics to suffer from a life threatening condition called diabetic ketoacidosis. While your cat’s diet and genetics certainly play a role, feline obesity is the biggest risk factor for feline diabetes. 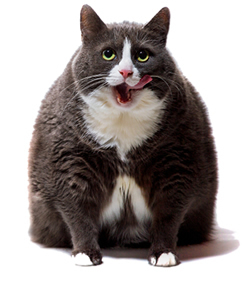 Indoor cats can often become sedentary and overweight, even while being fed a low calorie cat food. More than 1/3 of cats are obese and many owners don’t notice the weight creeping on. They also aren’t aware that excess weight can be extremely harmful to their pet’s health. Obese cats have a four-time greater risk of developing diabetes. We don’t often think of fat as an organ, but it is – it produces the hormones adiponectin, resistin and leptin which can affect how the body regulates glucose. For example, resistin causes the liver to release stored glucose into the bloodstream even if there are high levels of insulin present. Adiponectin slows the production of glucose in the liver and increases uptake by cells, and levels of this hormone are lower in obese cats. Consequently, too much body fat can result in higher than normal blood glucose levels. It has been shown that for each kilogram of extra body weight, your cat has a 30% reduction in his sensitivity to insulin. This results in the pancreas producing more insulin but if it can’t keep up this increase, the result is diabetes. To evaluate obesity in cats, body condition scores have been developed for veterinarians and cat owners to evaluate and track their feline friend’s weight. For example, the nine-point body condition score provides a simple and reliable method of determining body composition in cats. Another simple and easy way to evaluate body condition in the cat is to take photographs (from the front and side) every year. The body weight and body condition score should be recorded at least yearly, so you can identify changes easily. The most common contributing factors for feline obesity are age, whether they are desexed, frequency of treats, and how much the cat is fed. Treats are a large source of calories and a huge contributing factor to cat obesity. Portion sizes are also often too large. It’s best to measure portion sizes using recommendations from the food manufacturer and your vet. Cats are also more difficult to exercise; they’re not very keen on wearing a leash and going for a walk. If your cat already has diabetes, then weight loss can make it easier to regulate his diabetes and increase the chances of him going into remission. Food for diabetic cats should be low in carbohydrates, and canned food is preferable to dry kibble. If your cat is overweight and at risk of developing diabetes, it’s important that he loses weight. However, this needs to be done carefully. Rapid cat weight loss can lead to hepatic lipidosis, or fatty liver, which is in itself dangerous. Weight loss that is slow but steady is the key to keeping him healthy; however prevention is better than cure. If you can keep your cat trim, taut and terrific as he is growing up, you’re much less likely to have to deal with symptoms of cat diabetes.